During September 2009, it was announced that Standard Chartered Bank would become the main sponsor of Liverpool Football Club (£80 million over four years)....well I immediately felt that this could be beneficial to me, since American Express Bank (which I worked for from 1997 to 2008) had been purchased by Standard Chartered in 2008 and I was now working for that company. 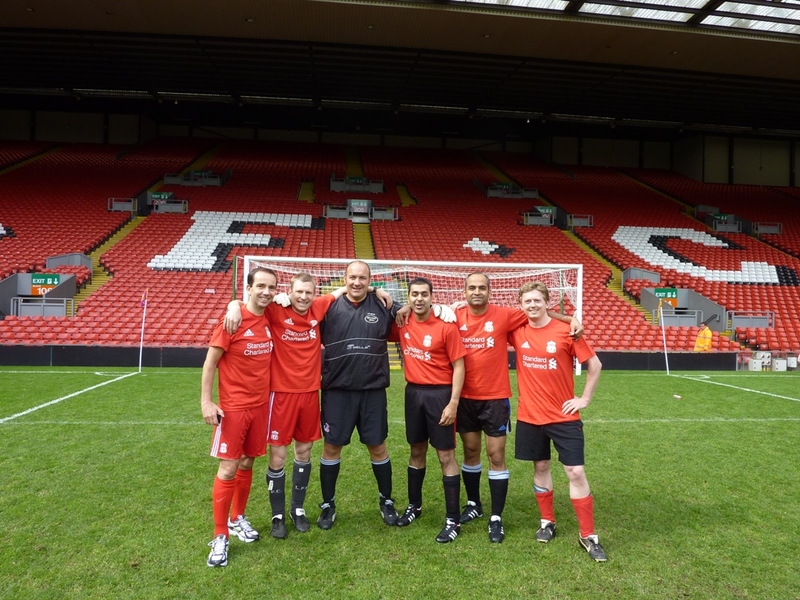 One day in 2011, a work email drops into my inbox, speaking about a 5 a-side tournament that is to be held at Anfield. Anyone can enter, and you need only put your name down and hope that you get in. The cost was £50.00 to the SCB charity, 'Seeing is Believing'. Well obviously I sent that email off the same day! Being only one of about 10 people in Poole (and the fact that no-one else was interested), I could not form a team, but instead did manage to group together with five other lovely chaps in London. And most importantly, we got in! So on the day, we all made our way to Paddington station in London (named after the bear) and got the train to Liverpool. A coach then took us to the stadium. 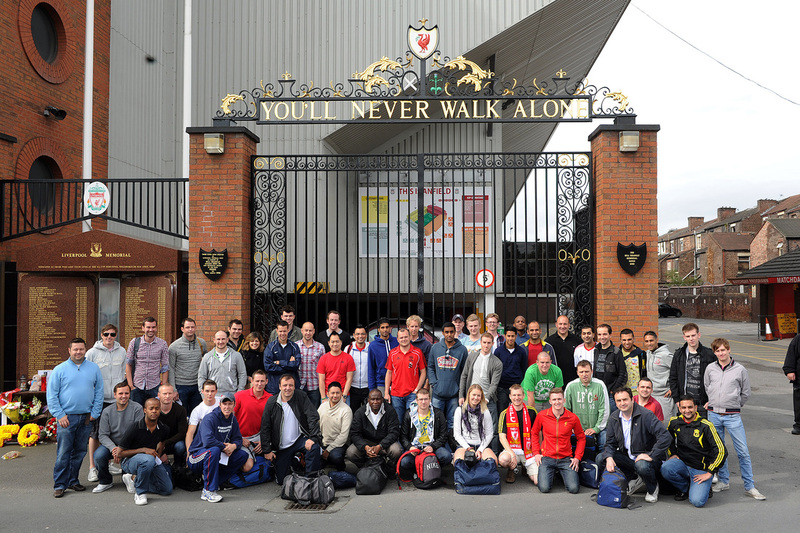 Image on the left is our motley crew of SCB employees outside the Shankley Gates. I'd been to Anfield on a number of occasions over the years (including the last day that the Kop was all-standing), but I obviously had never had the chance to go onto the pitch. I hadn't pulled on my Puma Kings for many years. Not since playing for Marconi/Merley. I'd played a lot of football since then, but pretty much all of it was 5/6/7 aside. It took a bit of getting used to - having studs sticking out the bottom of your boots! For my first few kicks of the ball, I was shaving the anfield turf. And what a turf it was! It was like playing on astro turf! So flat and uniform. Also, considering that we were there right at the end of a full season, I was amazed at just how good the surface was. The ball did not bobble on this pitch! 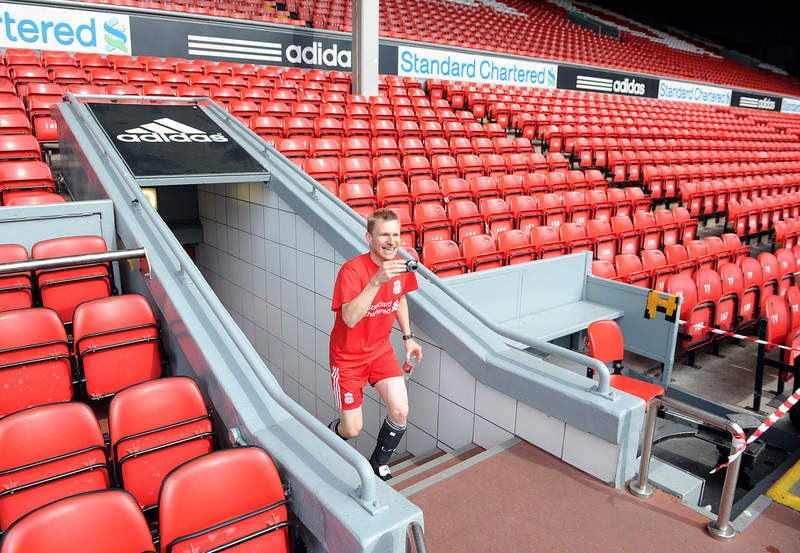 Image on left is me running out onto the pitch. It was so good, I did it twice! Here I am touching the most famous sign in football! Bill Shankley had that sign installed. What a beauty! I have to say that the people at the club were brilliant all day. Very chilled out and relaxed. I spoke to quite a number of the coaches etc and they were telling me that there was a real good buzz around the place (the best for a long, long time). This was because 'King Kenny' (Kenny Dalglish) had returned as manager. During my day there, I wondered around everywhere I could within the club. I opened every door I could find and looked at everything! One thing that was apparant to me, was that the changing rooms and general feel of the place was old. Not falling apart, but certainly built upon an old asthetic. The actual football we played was a five a-side tournament. The Anfield pitch was divided up into four separate pitches (still orientated lengthways along the pitch). When I first ran out onto the pitch, I could not resist myself...I took a ball (Liverpool had provided Champions League balls) - ran with it towards the Kop and smashed a shot towards Reina's goal. 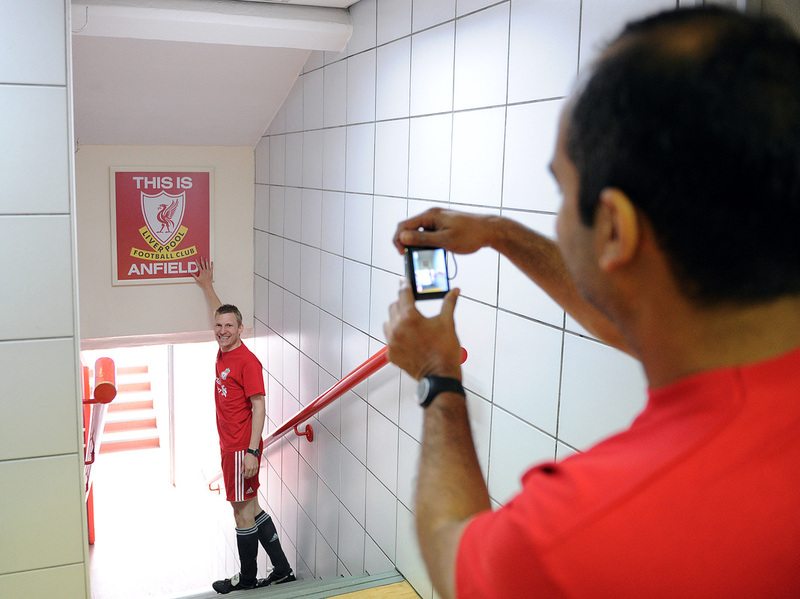 Amusingly, I missed by a mile and the ball flew into the Kop and disappeared down one of the stairwells! So then I spent several minutes 'clacking' my boots up the concrete stairs and then into the bowls of Anfield, trying to find the ball! During the tournament, Phil Neal and David Johnson turned up and chatted to us for a bit. 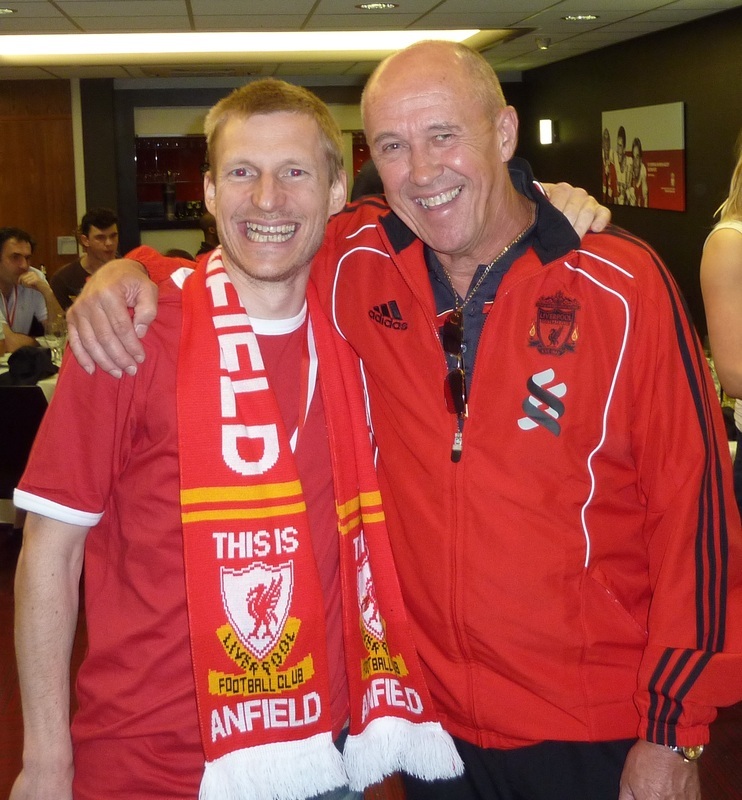 Phil Neal is just an incredible person - and a legend at Liverpool FC. This man played for Liverpool 417 times consecutively; without missing a single game! That was seven years without missing a match! I almost can't comprehend how that is possible! A lot of modern players now miss games if they have a spot of tooth ache. He was terrific on the day. So enthusiastic about the game and the club. And of course full of anecdotes and stories about Liverpool history. During the tournament, a professional photographer was present to take images during the day. He got some excellent shots and I was very pleased with this shot on the right. 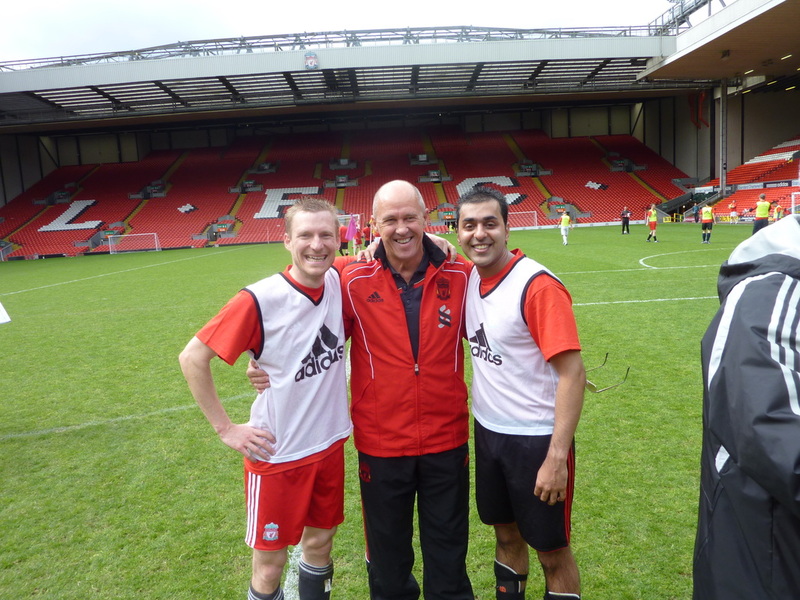 I was especially pleased because I had never had a single photo of my playing football, so now I have one - and at Anfield no less! Myself and Phil Neal. I seem rather happy! And here you have Phil Neal - he seems very happy to be with me! It's just amazing what this man achieved with Liverpool. He won 8 league titles with the club, 4 league cups, 1 UEFA cup and 4 European Cups! It's just preposterous that he played in five European Cup finals - and won four of them! There can't be many people who have done that. Is there anyone else that has done this? Please contact me if you do happen to know!